Edgar Allan Poe is associated with the macabre, so it's only natural that his image would be on bandages covering your wounds! 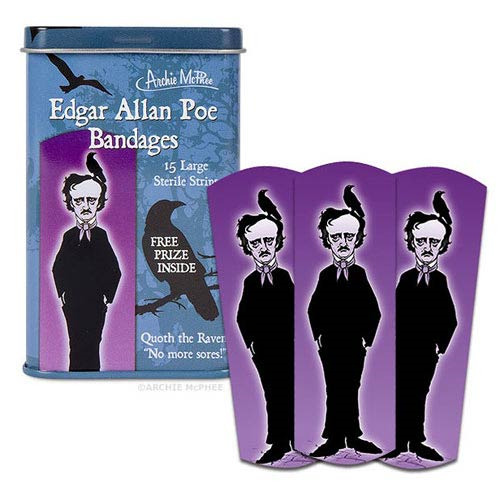 These 15 Edgar Allen Poe Bandages are packaged in a 3 3/4-inch tall metal tin. Each bandage measures 3-inches long x 1-inches wide, and is decorated with the image of Poe and his raven. As it says on the package, "Quoth the Raven, ‘No more sores!'" Each tin even comes with a prize! Latex-free adhesive.